What is the new Mission Sofa Server? Where do you park the reading material or devices while enjoying a TV show in your living room or den? Need a place to set down the ice-cream bowl while you take a brief bathroom break during the movie? Do you ever work on your laptop at the sofa? Brandenberry Amish Furniture recently unveiled a solution to a common problem: the new Large Mission Sofa Server with Drawer. The new Mission sofa server is a perfect accessory to your sofa or recliner. The Large Mission Sofa Server with Drawer features the timeless Mission design. Right down to the black Mission pull hardware and slats. So, it should blend seamlessly with your existing furniture. The designers included a handy drawer for quick access to those small, easy-to-lose items. They also built dovetail joints into each corner of the drawer for added strength. Also, the drawer opens full extension. So users can enjoy easy use of every square inch of the drawer. In addition, the magazine rack down below keeps current periodicals in an easy-to-access spot. 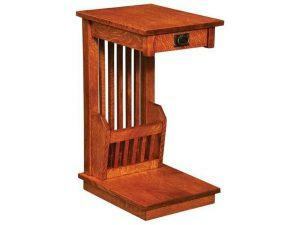 Amish furniture artisans handcraft each sofa server. And they use hardwoods like oak, maple and cherry. So, the sofa server is built very sturdy. In fact, with proper care, it should last for decades to come. Custom furniture lovers can order the unit as it is shown. Or, buyers can customize the sofa server. And the custom options include wood specie, finish and hardware. Be sure to select the color(s) that match your own personal styles. Match the color on the sofa server with your existing home decor’. The trained staff at Brandenberry Amish Furniture in Shipshewana would be delighted to show this and other quality furniture to lovers of top-quality Amish furniture.